"When exploring Lembongan, we stubbled across this gem, the seaweed farms were nothing to write home about in comparison to the worlds attractions, but i would certainly recommend finding them, and in the local area there are some very nice bars to unwind in, overviewing the farms and watching the sunset. It was fantastic to see how the locals made a living from the land, you really take in a lot on this island. Make sure you rent transport on Lembongan, make life so much easier, theres lots to see for such a tiny island." Nusa Lembongan and the small island Nusa Ceningan are connected to each other by a yellow suspension bridge. In the middle of the bridge there is a red sign that there are only two vehicles on the rickety bridge allowed. If you want to visit Nusa Lembongan it's sure that you will visit also Nusa Ceningan. Along the beach in the water on both islands the cultivation of seaweed takes place. The warm seawater, the few differences between the tides and the slight current creates an ideal climate for growing seaweed. The "farmers" put sticks in the water, connected with ropes. To this ropes they bind small pieces of seaweed. 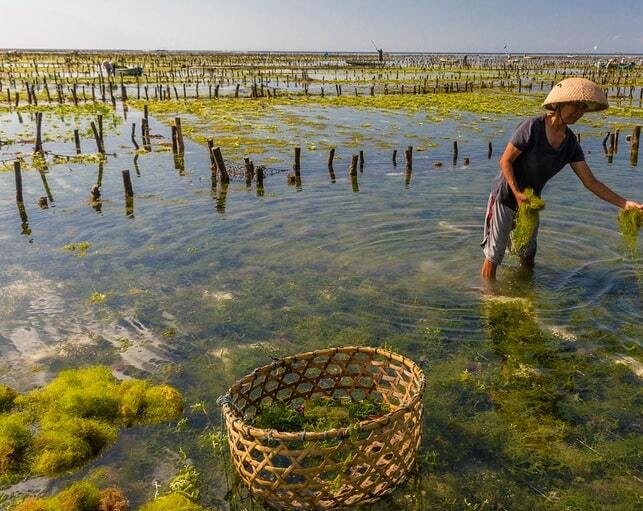 It takes 15 to 30 days before the seaweed can be harvested. The work is tedious and difficult. The fastest seaweed, a brown variant takes 15 days. The longest is 30 days. It depends on the type of seaweed, no matter how long the growth process lasts. 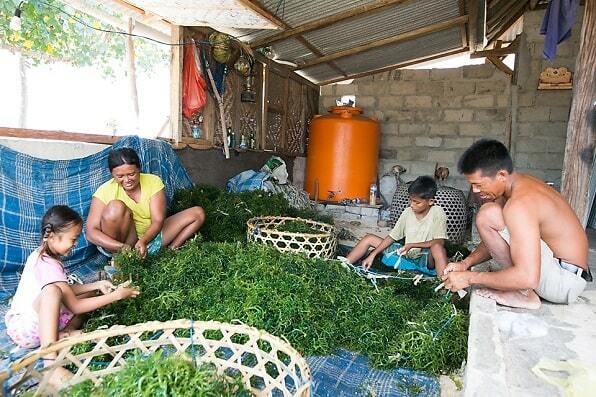 Seaweed production is a major source of income for the local population on both islands. However, it is a given that the cultivation of seaweed produces little (about 40 cents per kilo). Almost all the youth on the islands have cell phones and know what's happening further e.g. in Jakarta. There is a world open to them: music, fashion ... normal things that teenagers are attracted to. So it is not surprising that young people choose a job in the tourism industry. 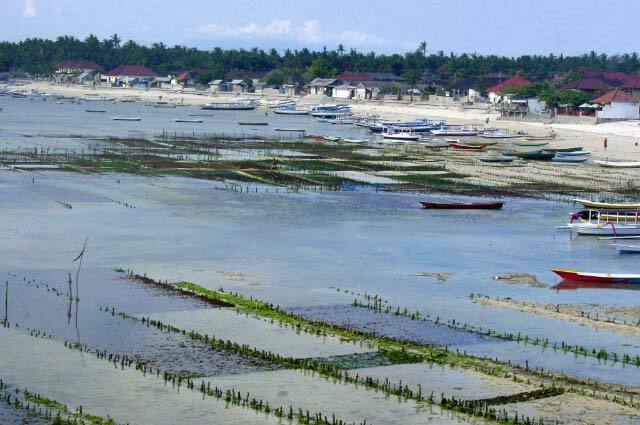 Along the coast you'll see that they have built a lot of seaweed plantations. The seaweed is only exposed at low tide. In these hours they have to pick as much as possible. In large baskets it is brought to the beach. It is clear that there are many types of seaweed. Some species grow only a certain period of the year, other throughout the year. Also, the growth process is different (15-30 days). This also determines the value of the seaweed. The coulors are very different. Some are brown, red, orange or yellow. If the seaweed is harvested they put it in large baskets and it's taken to the farmhouse. On the island of whole families sit down to sort the harvest by color and type. Some algae can be eaten, but are not very tasty. The leaves are quite thick, so it is not suitable for tasty dishes, but as a simple meal, it would still contain necessary nutrients. They take the sorted seaweed outside and laid to dry on a large plastic sheeting. When it has dried, it goes to the storehouse. If it is full, it is sold and shipped to Surabaya. The seaweed is sold to China, Hong Kong, Japan, Singapore and other places. Most seaweeds are used for animal feed, cosmetics, medicines and creams. The moisture in the alga namely, has a sort of gelatinous operation. Firstly, there is a social need. It provides an income on the islands for hundreds of families. Because children do not follow in the footsteps of their parents, they still get money in hard times, generated from tourism. 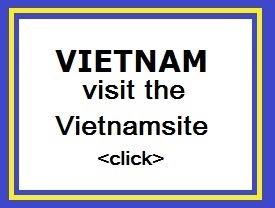 Should anything happen to tourism, there is no relapse. Secondly, there is the cultural preservation. You lose what the community is committed. Thirdly, there is the environment. Seaweed helps to retain the coral reefs by increasing the diversity of algae. Also seaweed also offers protection for small fish and invertebrates. And increasing the number of herbivorous fish and shellfish in the area by seaweed production. If what you're looking for is a conveniently located hotel in Bali, look no further than Dream Beach Huts. From here, guests can enjoy easy access to all that the lively city has to offer. A haven of rest and relaxation, the hotel will offer total renewal just steps away from the city's numerous attractions such as Dream Beach, Tanjung Sanghyang Beach, Jungut Batu Beach. Dream Beach Huts also offers many facilities to enrich your stay in Bali. Guests of the hotel can enjoy on-site features like free Wi-Fi in all rooms, 24-hour front desk, luggage storage, Wi-Fi in public areas, valet parking. In addition, all guestrooms feature a variety of comforts. Many rooms even provide air conditioning, wake-up service, desk, balcony/terrace, fan to please the most discerning guest. Throughout the day you can enjoy the relaxing atmosphere of the outdoor pool, fishing, massage, garden. Discover an engaging blend of professional service and a wide array of features at Dream Beach Huts.